HARARE, Zimbabwe (AP) — A prominent Zimbabwe pastor and activist who faces a possible 20 years in prison on a subversion charge said Thursday it is “heartbreaking” to see the new government acting like that of former leader Robert Mugabe, as alarm grew about a violent crackdown on people protesting a dramatic rise in fuel prices. Mawarire, also accused of “encouraging civil disobedience” on social media, was one of more than 600 people arrested this week as the country faces its worst unrest since deadly post-election violence in August. Zimbabweans heeded a nationwide stay-at-home call after the government made gasoline in the economically shattered country the world’s most expensive. Mawarire famously launched the #ThisFlag campaign that led to nationwide anti-government protests in 2016 against mismanagement and Mugabe. He was acquitted of a similar subversion charge the following year. The U.S. Embassy in Zimbabwe said it was “alarmed” by credible reports that security forces were targeting and beating activists and labor leaders after a local doctors’ rights group said it had treated 68 gunshot cases and scores of others involving assault. The U.S. also urged Zimbabwe’s government to restore access to social media. The UK’s minister for Africa, Harriett Baldwin, said she had summoned Zimbabwe’s ambassador to discuss “disturbing reports of use of live ammunition, intimidation and excessive force” against protesters. Hungry residents of Harare on Wednesday reported being tear-gassed by police as they ventured out to seek food. “Are we at war?” one resident asked. The city was largely quiet on Thursday as people stayed home, with schools and many shops closed and soldiers controlling long lines at the few gas stations open. President Emmerson Mnangagwa while traveling overseas has denounced what he called “wanton violence and cynical destruction” but appeared to side with authorities who blame the opposition for the unrest. He had announced the more than doubling of fuel prices shortly before leaving the country. Zimbabwe’s inflation rose to 42 percent in December, the country’s official statistics agency said Thursday. While Mnangagwa’s extended overseas trip will include a stop at the World Economic Forum in Davos, Switzerland, to plead for more foreign investment, former military commander and Vice President Constantino Chiwenga, a hardliner, is in charge at home. 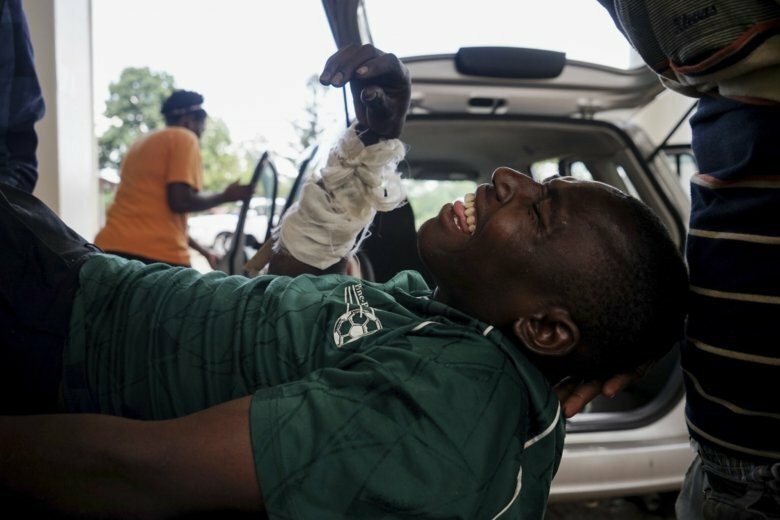 In a grim recounting of alleged police violence this week, the Zimbabwe Association of Doctors for Human Rights said late Wednesday it had treated 68 cases of gunshot wounds and 100-plus other cases of “assaults with sharp objects, booted feet, baton sticks” and more. It noted bites from the alleged unleashing of police dogs, and the “dragging of patients with life-threatening conditions” to court. Death tolls this week have varied. Eight people were killed on Monday when police and military fired on crowds, Amnesty International said. Zimbabwe’s government said three people were killed, including a policeman stoned to death by an angry crowd. Some Zimbabweans said the social media shutdown meant they didn’t know the situation and preferred to stay in their homes. “I can’t tell whether it’s safe or not, why should I take a risk?” said Elsy Shamba in Harare’s Kuwadzana suburb, one of the areas where residents said soldiers indiscriminately assaulted people earlier in the week.